Mount Grace is ideally positioned for that perfect retreat and is also an attractive option for visitors from abroad setting out or returning from a holiday. Mount Grace Country House and Spa is an ideal choice for guests seeking a sophisticated country hotel with the highest levels of service and luxury, as well as that personal charm found only in small establishments. This Magaliesburg lodge is set in 10 acres of exquisite gardens and is a haven of tranquillity and beauty offering the best of South African rural life. Mount Grace Country Hotel and Spa offers a range of luxurious health and spa treatments, including hydrotherapy, massage, body wraps, and skin care treatments. The hotel's therapists spend some time with you to create an individualised program that ensures total wellness of body, mind and soul. 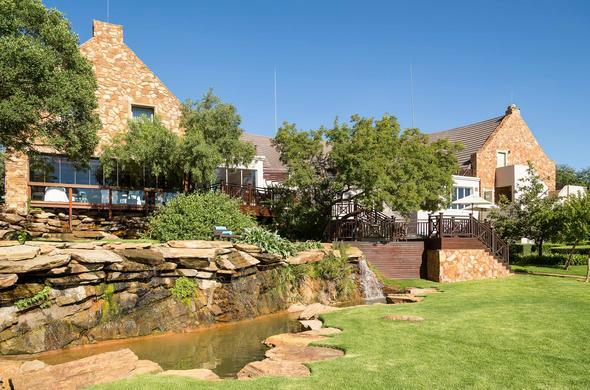 Activities at this Gauteng country lodging include mountain biking, croquet, bowling, trout fishing, bird watching, walks, tennis, picnics, golf (Pecanwood is about 15 minutes away), horse riding, squash and hot air ballooning. Meals are served at the lodge's two restaurants - Rambling Vine and Twist Restaurant. Seasonal menus and award-winning wines can be enjoyed at Rambling Fine, whereas Twist Restaurant provides an unconventional way of serving all-time favourites such as waffles and home-made pastries.